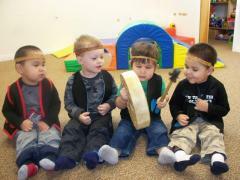 The Tseshaht First Nation Daycare (t’aatnee?is Daycare) program delivers various programs. We have an Infant and Toddler program for 0-3 year old children and a 3-5 year old Head Start Daycare Program. The daycare programs operate Monday to Friday from 7:45am – 5:00pm. If space is available we offer a Preschool Program for 3-5 year olds. All children who are enrolled in the daycare program participate in the preschool program. Our program is a Head Start Program. We follow six Head Start components which are Culture and Language, Education, Health Promotion, Nutrition, Social Support, and Parent and Family Involvement. As well, we have an After School Program for children 6-11 years old. The program operates Monday to Thursday from 2:45-5:30pm and Fridays from 12:30-5:30pm. The program offers a healthy snack, outdoor activities, art activities, and indoor activities.